D+ Browser is a simple web browser which was developed specifically to help you quickly navigate the Internet.. D+ Browser is a simple and basic yet quick web browser with emphasis on security. This modest yet effective web browsers features modern tabbed browsing interface, it has extremely low memory usage, and it has tiny executable size. There is a support for HTTPS without certificate validation via OpenSSL or CyaSSL. It has built-in private browsing mode that is always on. In other words and simply stated, D+ Browser is a very simple and clean web browser which enables you to surf the web, as well as add bookmarks and manage them, and customize settings. D+ Browser is a simple web browser which was developed specifically to help you quickly navigate the Internet. The installation process does not offer to download or add any third-party products, and after you wrap it up, you are greeted by a simple and a bit outdated interface. It can be used by anybody with great ease, regardless of their previous experience with computers, and it encompasses an address bar, a few buttons and a panel to display websites. 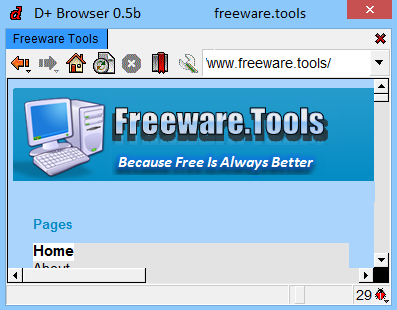 This software tool enables you to go back and forward, at your homepage, as well as refresh or stop a page. Furthermore, you can bookmark specified pages and manage them by creating sections. The main window also presents a search bar, which lets you look for items according to keywords, and on a few built-in websites. To be more precise, you can look for information on Google, Wikipedia, Softpedia, SourceForge and the Free Dictionary. From the settings panel, it is possible to establish your home and start page, panel and icons size, show or hide different bars and tabs, adjust the initial window size and zoom percentage, font type, style and size, as well as input proxy settings. Bookmarks can also be uploaded from the hard drive, and you can add other search engines, edit the existing ones or change their order. You should know that the first site in the list will be used as the default. All in all, D+ Browser is a pretty decent piece of software, with an intuitive interface and a relatively good response time.